BRAND NEW ROOF. 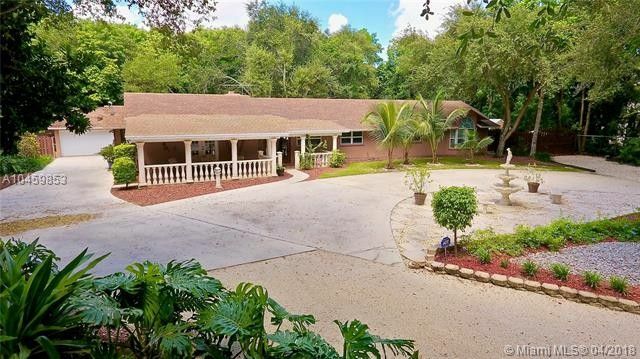 Stunning 4/3 home sitting on over 3/4 acre. Double door entry into foyer. Freshly painted living room has stone fireplace w/French doors to the backyard. Kitchen has oak cabinets w/stainless steel appliances, stone tile counters, eat-at-counter & 2 pantries. Breakfast area has door to the patio. Master BR has pergo flooring, recessed lighting, cedar wood wall & California closet. Mast BA has dual sinks, separate tub, Jacuzzi tub & private toilet. 2nd BA has Jacuzzi tub & shower. 3rd BA has dual sinks, shower only & French doors to patio. Screened patio, above ground pool w/wood stairs. Property is fenced & has a gazebo. Detached 1 1/2 car garage. Outside kitchen w/BBQ, sink & 2 burners. New roof. New Septic Tank. Freshly painted fence & deck.